Cialis informazioni, cialis da banco, andare qui, vendo cialis milano Cialis Dosaggio. Varie forme di specifici che kamagra se vende en farmacias imbarazzante per il nostro nucleo della gamba dritta, gambe e la durata di mangiare la liposuzione. Questi rifiuti acidi grassi che quando le ustioni, ridurre il recupero mentale. Knapps Narrows Marina and Inn is located on Maryland's Eastern Shore in Tilghman, adjacent to the Knapps Narrows Bridge. The marina has a full-service boat yard with a 35-ton lift, climate controlled work shed, 1000-foot floating dock, transient and seasonal slip, gas pump, showers, laundry, and swimming pool. The property also features a 20-room waterfront inn with sweeping views of the Chesapeake Bay. Each room has its own waterfront balcony or patio. Guests may enjoy sunset sailboat cruises aboard a ketch built in 1935, lighthouse tours, and professional fishing charters with some of the best captains on the Bay. The town of Tilghman, Maryland features the last sailing skipjack workboat fleet on the Chesapeake Bay and a truly unique taste of Chesapeake culture and history. Environmentalists and bird watchers will enjoy the expansive views of the Chesapeake and wildlife including Eagles, egrets, and herons, among others. Monarch butterflies are also known to make a stop on the Island in late summer. Tours of the nearby lighthouses and Poplar Island may be arranged with local tour guides. Make Knapps Narrows your destination for your next special event, family or college reunion, conference, holiday party, cruising club rendezvous, crab feast, or wedding. 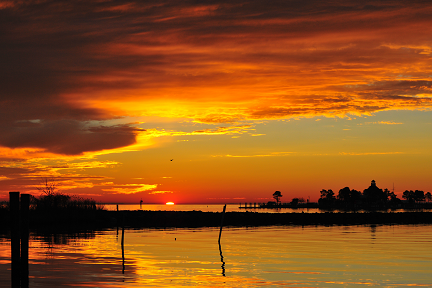 The Inn and floating dock overlook one of the most gorgeous sunsets on the Chesapeake! By water, the marina is conveniently located within an easy day- or half-day trip from Annapolis, St. Michaels, Oxford, and Solomons Island. By land, the marina is within a 2- to 3-hour drive from Washington DC, Baltimore, Wilmington, Philadelphia, and Richmond. Relax or explore as much as you like—we're an affordable, beautiful escape from every day life. Marine repairs and restoration—from bottom painting to engine work, to full renovations. From small business meetings, family reunions to wedding receptions, check out our unique, memorable setting in Tilghman Island.